The guest speaker will be Retired Lieutenant Colonel Ryan Yantis who was in the Pentagon during the attack on September 11th 2001. He will share his story about his experiences that day, and the impact it has had on his life since. 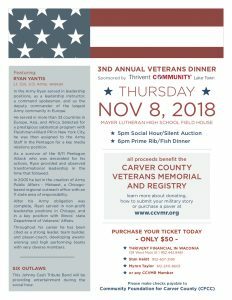 All proceeds benefit the Carver County Veterans Memorial and Registry. Learn more about donating, how to submit your military story or purchase a paver at www.ccvmr.org. PURCHASE YOUR TICKET TODAY- ONLY $50 – at Thrivent Financial in Waconia, 129 West Main St. (952-442-8461), or from Stan Heldt (952-657-2169), Myron Taylor (612-240-8603) or any CCVMR Member. Please make checks payable to Community Foundation for Carver County (CFCC). Click here to download or view the event flyer.